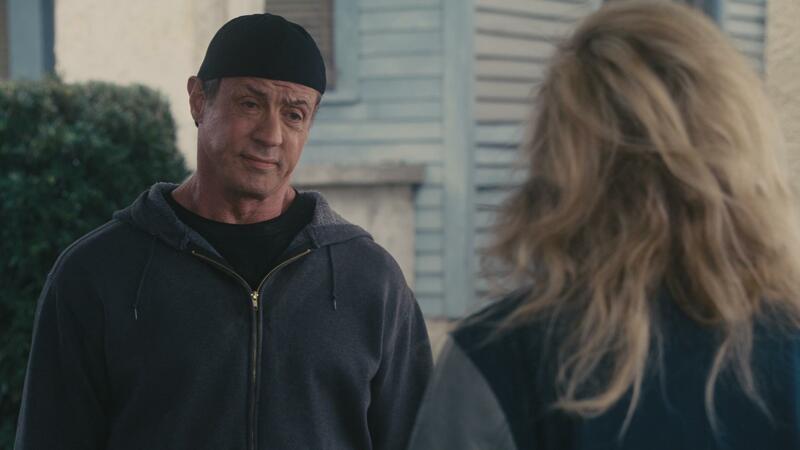 The term "it's only a movie" is never more evident than in the 2013 Christmas day release of Grudge Match. If two 70 year old men (star Sylvester Stallone is 67 but go with what I'm saying) were to meet in a long overdue, (nationally) televised boxing rematch (they're are tied at one win a piece from what took place over 3 decades ago), then just call me the President of the United States. But seriously folks, nothing that happens in this flick would ever surface in the real world. I gotta admit though, it's a self deprecating, little vehicle that surprisingly, is a lot of fun. The bulk of it is not as bad as what I expected. And it tries to bury the notion of being uncoy by adding two deepened subplots involving the neglected adult child of De Niro's character and Stallone's notion of a forgotten romance. "Match" is one of those pictures that would be viable to see if nothing else good was playing at your local multiplex (or if you've seen everything out there). Yeah, I'd say that what's plastered on screen is a good way to kill two hours before everything that happens, evaporates right before your very eyes. Including a few unsubtle nods to the Rocky movies (a subdued ending reminiscent of any one of the first 4 installments and featuring segments involving eating raw eggs not to mention almost punching raw meat) and taking place in the iron city of Pittsburgh, Pennsylvania, Grudge Match facades the delayed reunion of two stubborn boxers who are inherently past their prime. The two actors featured decide to combine their glory days by channelling their stints as an overweight rasputin from Raging Bull and an underdog droop from 1976's Oscar triumph Rocky. Basically, they milk their beloved characters for what else, a lightweight drama slash straining, comedic romp. Robert De Niro, almost looking like an older version of his character Johnny Boy from Mean Streets, plays out of shape fighter Billy "The Kid" McDonnen. Stallone, Billy's counterpart and bitter nemesis, crabs and complains as down on his luck, punch-drunk Henry "Razor" Sharp. Both old timers are summoned back into commission by a money-hungry promoter in Dante Slate, Jr. (played by Kevin Hart acted like well, Kevin Hart). The whole two hour running time then culminates in a bloody boxing tryst that gains popularity through the act of You Tube inheritance (call me old school but I'm getting really tired of every movie featuring this relenting technology phase). As I watched Grudge Match, I couldn't help but observe the make-up of such an impressive cast. I mean you have three Oscar winners (De Niro, Alan Arkin, and Kim Basinger) and one Oscar nominee (Sly "yo" Stallone of course). Yeah, they might be losing a bit of integrity or slumming it a bit, but you gotta hand it to director Peter Segal for somehow convincing everyone to get on board (it could have been someone else on the crew, who knows) for a cinematic exercise likely to find itself stuck in the $4.99 Best Buy bin (a year or two from now I'm thinking). In essence, I have to start with Robert De Niro. With the exception of some impressive work in Silver Linings Playbook and a small cameo in American Hustle (these features are a couple of directorial stints by David O. Russell), he reluctantly is coaxed into taking on every script that is thrown at him. Whether he's bored or wants to avoid retirement, Bob has managed to show up in 7 count em' seven, movies in 2013. I read somewhere that a critic thought he needed a hobby. That might not be too far from the truth. Then there's Stallone. He's obviously not capable of carrying a film these days with duds like Bullet to the Head, Escape Plan, and soon to be "Match" on his resume. With The Expendables parts 1 and 2, at least he's able to garner enough box office clout provided that every other catalog of action hero (on board) decides to sign up. Oh and I almost forgot, Alan Arkin is featured and he's content on wanting to reiterate his "woe is me I'm old" factor into these proceedings. With this flick and Stand Up Guys, Arkin is a walking contradiction being that one minute he's in a wheelchair and the next minute he's wildly driving expensive cars, and exhaustively training over-the-hill boxers. Last but not least, we have the fetching (at 60 years old mind you) Kim Basinger who has taken an acting hiatus only to show up as rusty as ever playing Stallone's character's remorseful squeeze. Basinger hasn't surfaced in a feature length film in three years and regretfully, I can see why. Her individual scenes with everyone reek of desperation and paycheck malaise. She obviously wants to get back in the limelight so I'm hoping she'll give directors Curtis Hanson, Barry Levinson, or Adrian Lynne a call in the near distant future (let's not hold our breath people). When it all comes down to it, Grunge Match is vanity stricken, hell bent, fire brewing from Stallone's need to let everyone know what cinematic virtues he's still about. It's not awful, it's not misbegotten, but it reminds the audience of a time in his career that is long lost gone. See it for the novelty, see it for the familiarity, but don't discount how irrelevant the events are that occur. What's on screen may not be bona fide art, but it is reluctantly, a popcorn-filled time killer. And if you go into the theater with low expectations, it's "grudgingly" bearable. That's how I score my card. Do you think this is as expendable as other of the veteran actor's recent work? Say, "The Expendables"? Or, "The Family"? Or does this film have something that those two don't? It's nothing like The Expendables. I suppose it's like the Family because in that film De Niro made nods to his Goodfellas character like Stallone does with his Rocky character in Grudge Match. I'd say Grudge Match is like Rocky but comedic and goofy. Ultimately, not as bad as I thought but a mixed review nonetheless. While it definitely can be amusing at times, I still felt like it definitely didn't get to the big fight soon enough and left me a bit bored and uninterested. Good review Jesse. Thanks for your feedback. I didn't necessarily find the film boring. I actually liked what was going on the outside with De Niro's relationship with his son and Stallone's old girlfriend (Kim Basinger). But I agree with you on the big fight. I felt like a lukewarm version of a Rocky ending. The fight was a letdown even though the stars were bloodied up (like the Rocky movies). Anyway, not as bad as I thought, but a mixed review for sure.